Strong work ethic and competitiveness of boomers drive success and over-achievement. 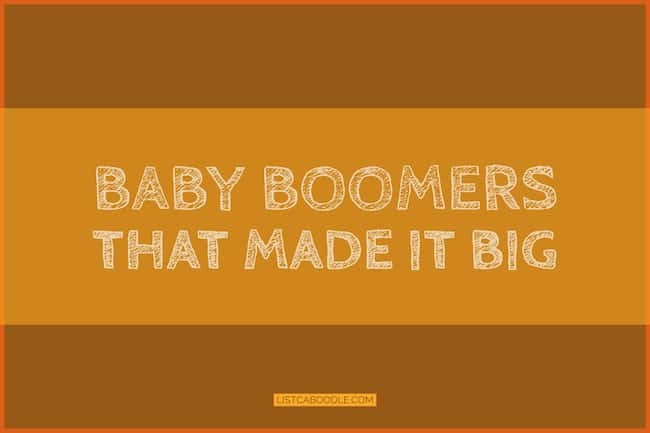 When you consider all of the successful baby boomers that are top performers, there’s a long list. Boomers’ characteristics like strong work ethic, competitiveness and discipline provide the right formula for high achievement. They’re also noted for being goal-centric, resourceful, team-oriented and self-assured — all great characteristics if you were drawing up the ideal person to succeed in today’s world. There may not be any fixed years that define the birth of baby boomers, the year after the World War II ends is considered the ideal starting birth year. And the ending birth year is considered to range between 1960 and 1964. So anyone born between 1946 and 1964 is considered as a boomer. Those born during the later part of this era have their own term, “Generation Jones.” On the other hand, millennials represent the generation that was born between the early 1980s and the early 2000s. Baby boomers are the healthiest and wealthiest generation in history. They are the first generation to grow up with the expectation that the world would become a better place. It is perhaps this positive outlook and the vast opportunities offered at a peaceful time that helped these 13 boomers overachieve and create history. Michael Jordan is one of the most recognizable sports success stories among baby boomers. The legendary professional basketball player currently owns the Charlotte Hornets in the NBA. The NBA considered him to be the “greatest basketball player of all time.” Jordan earned 14 MVP awards, 6 NBA Championships, 14 All-Star games, and dozens of other achievements that make him the greatest player in the sport. Not only did his accomplishments make him a success, he also played a big role in popularizing NBA. Steve Jobs was one of those people who could claim that they changed the world. He was more a visionary than a businessman who revolutionized the way people listened to music, started the smartphone and tablet revolution, transformed the way hardware and software were sold, and brought the personal computer into homes. And that he created the most valuable brand in the process should be seen as a byproduct of his pursuit of perfection. Time called him “the most famous maestro of the micro” for his unparalleled accomplishments in his field. The Oprah Winfrey Show was the highest-rated TV show of its kind ever. And it held that distinction for 25 years. The media owner, producer, actress, and philanthropist is a baby boomer who has become the “Queen of All Media.” Winfrey’s is a true rag to riches story. She is not just the richest African-American, she is also considered as the greatest African-American philanthropist of all times. Winner of the Presidential Medal of Freedom, she has also ranked as one of the most influential women in the world at different times. One of the greatest directors of all times, Steven Spielberg is another baby boomer who is a force in his industry. Born a year after the World War II ended, the director, screenwriter, and producer has created films in a wide range of genres and themes for over four decades. With Academy Award winning films like Saving Private Ryan and Schindler’s List under his belt, it is hard to find a director who comes close to the versatility and depth of Spielberg’s works. Spielberg is also the highest-grossing director ever. Here is a baby boomer who went on to become the first African-American President of the United States. The 44th President of the US, the former Illinois Senator not only became the most powerful man in the world he also made reforms and changes that made the world a better place. Healthcare reforms, ending the war in Iraq, investing tens of billions in renewable energy, improving the nutrition of school lunch, banking reforms, and green initiatives are just of his feats that put his name in the annals of history as a successful baby boomer. Check out some of Baby Boomers favorite TV theme songs like Hogan’s Heroes, Gilligan’s Island, Welcome Back Kotter and more. When J.K. Rowling struggled through her early life as an author, living on state benefits, she may have never thought about becoming the first billionaire author in the world. The British novelist created the Harry Potter series of books, selling 400 million copies, which was a record in itself. And the success of the series of films by the same name shouldn’t need any mention. The 2010 Most Influential Woman in Britain is also a committed philanthropist who has supported charities like Multiple Sclerosis Society of Great Britain, Comic Relief, and many others. There will be many great actresses, but there will not be someone like Meryl Streep. With 21 Academy Award and 31 Golden Globe nominations, Meryl is way beyond the “best actress of her generation”. The 3-time Academy Award winner has also won several national awards including the Presidential Medal of Freedom and the National Medal of Arts from President Barack Obama. Master of versatility, Streep has demonstrated many times how dexterously she can adapt to different accents for her roles. Streep is a baby boomer par-excellent. When baby boomers have made it big in all other fields, why should music be left out? Popularly known as “The Boss,” Bruce Springsteen is loved for his unique style of poetic lyrics. The American singer and songwriter has also raised political issues through his songs. He is known for his energetic and long stage performances and his work includes both folk songs and rock albums. With over 140 million records sold worldwide, he is among the best-selling artists ever. Not since Motown’s performers were fan favorites has one artist maintained such longevity. The 20-time Grammy Award, one-time Academy Award, and 2-time Golden Globes award winner is a baby bomber who has exceeded expectations in a spectacular way. If you are someone who invented the World Wide Web (WWW), you are certainly one of the greatest inventors of all times. No one can define the benefits of the WWW and how it has changed the world forever. Sir Tim Berners-Lee created used the internet to create the first communication between a Hypertext Transfer Protocol client and server in 1989. The Queen Elizabeth II honored him with the title of knight for his work. Lee is among the 100 Most Important People of the 20th Century and has won several other accolades including the Turing Award. Born in 1964, Jeff Bezos is another baby boomer who rode on the technology wave and became one of the richest people in the world. The American entrepreneur is the chairman of the largest online shopping retailer, Amazon. The Time Magazine’s Person of the Year and winner of several other awards and accolades, Bezos began small at the beginning of the IT revolution. This baby boomer has also been recognized several times as one of the best-performing CEOs. Baby boomers have been making it big in the field of sports, entertainment, technology, politics, and beyond. Dr. Robert Jarvik, the American scientist and entrepreneur, is well known for creating the implantable artificial heart, the Jarvik-7. Jarvik found the inspiration for his innovation when he was a student and his father was diagnosed with heart disease. He learned from the first time that a large population of patients were in need of heart transplants but finding a donor heart was almost impossible. He graduated as an MD from the University of Utah and designed the first permanent implantable artificial heart that gave life to so many people. Wayne Gretzky is another baby boomer who made it big in the world of sports. Known as “The Great One”, Gretzky played 20 seasons in the NHL and became the greatest ice hockey player ever. He has more goals and assists in NHL history. Many of his feats in different seasons also remain unmatched. With 61 NHL records to his name, it is hard to see anyone equal this legend’s records. The Hockey Hall of Famer also has many trophies and awards named after him. Bill Gates made it big by launching the largest PC software company in the world, Microsoft. The business tycoon and investor is also a well known philanthropist who has contributed to improving health and environmental conditions in developing countries through his Bill & Melinda Gates Foundation. The former chairman of Microsoft has consistently held the title of the world’s richest man several times for many years. The Bill & Melinda Gates Foundation has led to groundbreaking discoveries in the field of vaccination and other health areas. This has helped save millions of children’s lives in the developing world. See Bill Gates’ take on the Bitcoin phenomenon. Overall, successful Baby Boomers have set the mark very high for groups like Millennials that follow them. Are these successful boomers tied to their generation or would they have been successful no matter when they were born? It’s a question for the ages. But, there’s not denying the success of this group.